Kakbank is a do-it-yourself charity. We are convinced that the world can be more fair if people only are give a chance. Once a month we meet at the someone's home and those who wish donate 50 crowns (rouhly $10) to the bank. The collected money we then lend to people in developing countries that are working to support themselves, so called microcredits. The projects we find at Kiva.org. 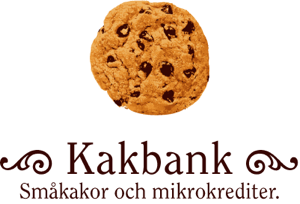 During the time discuss which projects to lend to, we enjoy the homemade cookies, which has lent us the name: Cookie Bank, or "Kakbank" in Swedish. When the loans are repaid (which on average they do more than 98% of the time), we invested the repaid money in new loans or donate it to traditional charities, eg Doctors Without Borders. We believe that Microcredit, ie small loans with relatively short repayment term and low interest rates, are a good way to give individuals the opportunity to help themselves. It is not the solution to all problems in the world, but it is certainly a step on the road. And sometimes that's enough! Kakbank is not only good for people far away - it benefits us too. The discussions regarding the projects, the cakes and the shared laughter is an important part of what Kakbank is. Kakbank was started in spring 2007 by Peter Kelly, in Sweden. With the help of Johanna Rydelius, Marie Lindström, Martina Stroltz, Elisabeth Martinsen, Maud Rangert, Johanna Sjödin and others involved, the bank has spread to more cities. Each Kakbank is independent - financially and in all other ways - and decide themselves how they want to manage their bank. The idea of Kakbank won IM Prize of 2009 with the motivation: " With the help of modern communications technology coupled with good control of the borrower and implementing Kakbanks members can support sustainable development and poverty reduction in many developing countries. "We are very proud and grateful for the price! Good things rarely come alone and the idea of Kakbank also received Göteborg's students big price of 2009. Thank you! We were also delighted that Peter received Homebaker of the Year 2009 for his work with Kakbank. We celebrated with the classic mandelkubb-cake! Kakbank has from the beginning and in every moment project of pure joy. So why not join your local Kakbank or start your own Kakbank . It is easier than you think! If you have any questions, feel free to email peter at kakbank dot se!